Once in a while, the day rushes by without any attention to what we will do for dinner. I find myself in need of a very simple recipe and a quick dish that I can get on the table in a half hour or less. I want minimal chopping, uncomplicated prep work and as little clean up as possible. When making Indian food, I spend plenty of time chopping onions and tomatoes, mincing ginger and garlic, toasting and grinding spices one by one, and then hovering by the stove waiting for each additional layer to cook. 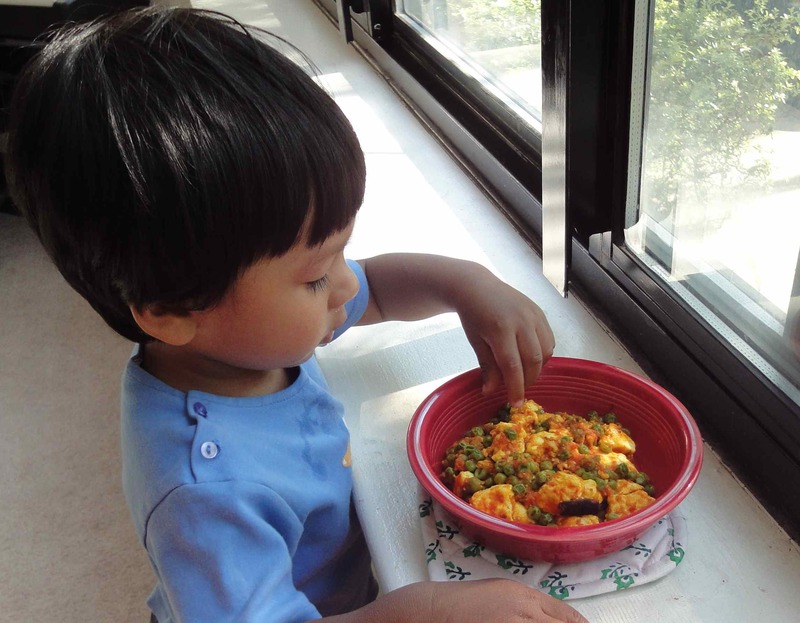 In fact, my original recipe for matar paneer belongs to that category of dishes. This time I want to find a simple process that still yields a delicious dish. My mother suggests her version of matar paneer. 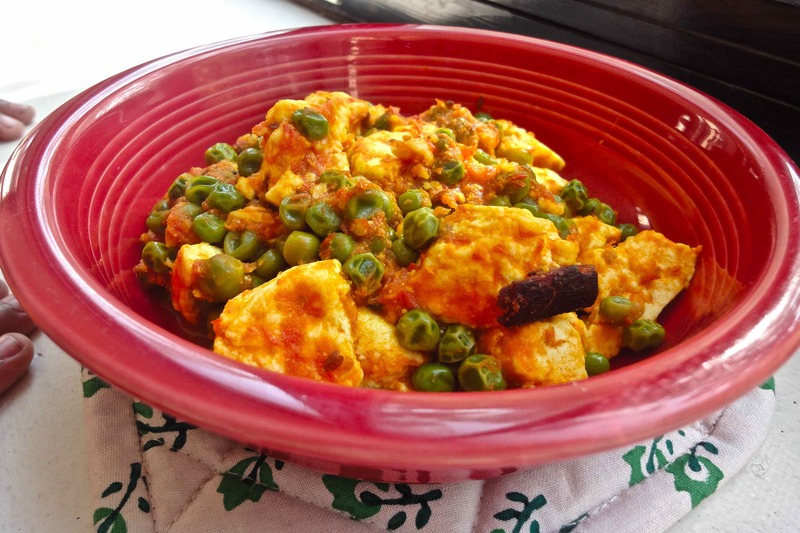 Paneer, if not readily available, can be made in the time that the sauce cooks, and the peas are in the freezer. For the sauce, all I need is three ingredients, tomatoes, ginger and garlic, all blended together with a quick turn in the food processor. Heat the oil, temper with cardamom and cumin seeds, and then add the sauce. Add pinches of basic Indian spices — turmeric, red chilli powder and garam masala, along with a little salt and sugar. Once the oil separates in a few minutes, add some water and the peas. When the peas are cooked add the paneer. The aromatic dish, with a lingering taste of ginger and garlic, with soft cubes of cheese and sweet peas that work well with the acidity of the tomatoes, is ready to eat. 1/4 tsp cayenne pepper powder or red chilli powder. Can add more to taste. 1. Heat the oil in a pan and add the tempering spices. Meanwhile, blend the tomatoes, ginger and garlic in a food processor. Add to the pan after the cumin sputters. Add all the dry spices. Now cook for several minutes, until the oil floats on top of the tomatoes. 2. Add the peas and about a cup of water. Cook for a few minutes, until the peas are cooked. Now add the paneer, cook for another couple of minutes. Serve hot with rice or Indian style bread.